Bharat Sanchar Nigam Limited (BSNL) has extended its widely popular ‘Bumper Offer’ that was originally launched back in September last year. The offer is designed to offer prepaid users 2.2GB additional data per day. It is valid for BSNL recharge plans ranging from Rs. 186 to Rs. 2,099. The latest move comes months after the state-owned telecom operator added the Rs. 1,699 and Rs. 2,099 recharge plans to its Bumper Offer and reduced the daily data benefits from 2.2GB to 2.1GB. The listing on the BSNL website confirms that the Bumper Offer has been extended from the previous deadline of January 31 to April 30. The extension will come in force from February 1. As per the extended Bumper Offer, customers buying the Rs. 186, Rs. 429, Rs. 485, Rs. 666, Rs. 999, Rs. 1,699, and Rs. 2,099 recharge plans will be eligible to avail the benefits of 2.2GB daily data benefits starting February 1. This is similar to the original launch of the offer that was announced back in September last year. However, the previous extension brought the additional data benefits to 2.1GB for new subscribers. The revised Bumper Offer will bring as much as 3.2GB data per with the Rs. 186, Rs. 429, and Rs. 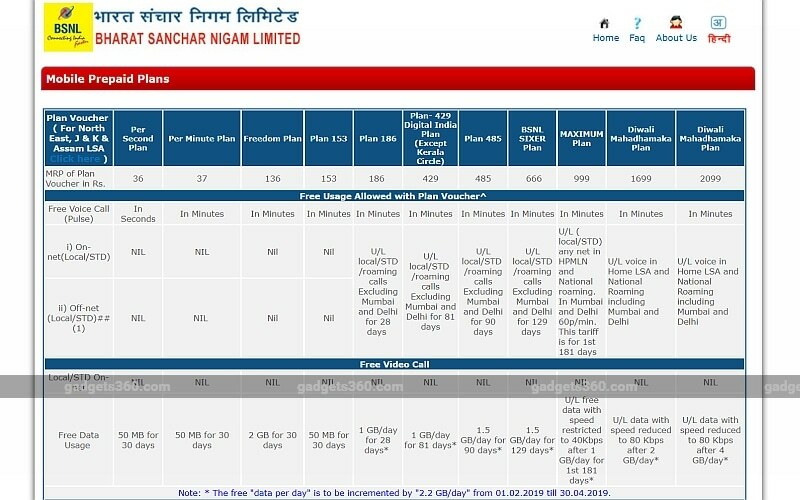 999 BSNL recharge plans that were originally giving 1GB data per day for their respective validity. It will also enable the Rs. 485 and Rs. 666 recharge plans to provide 3.7GB data per day, though they were originally entitled to give 1.5GB data on a daily basis. The offer will also make the Rs. 1,699 recharge plan capable to give 4.2GB daily data benefits against their original 2GB high-speed data per day ceiling, whereas the top-of-the-line, Rs. 2,099 recharge plan will offer 6.2GB data per day – over the original 4GB data per day. Notably, the validity of the BSNL recharge plans will remain the same. This means the Rs. 186 recharge plan will continue to offer a validity of 28 days, while the Rs. 429 plan will be valid for 81 days and the Rs. 485 recharge plan offers 90 days validity. Similar is the case with the Rs. 999 recharge option that will be valid for 181 days. Furthermore, the Rs. 1,699 and Rs. 2,099 plans will have 365 days validity. Telecom Talk first spotted the extended Bumper Offer. The offer will reportedly be available across all BSNL circles except Kerala.